Ladies of a certain age will remember what a hankie envelope is. Since I am not “of that age,” I had to look it up! I did wonder about the number of hankies one would own and where did one store them after they were cleaned but not needed for the moment. Hankies made of silk especially needed careful cleaning and storage, but linen and cotton required ironing also. So the hankie envelope or hankie box became the answer. The hankie envelope was a fabric case, many times embroidered by its owner and many things besides hankies were tucked away- a girl’s diary or love letters might be kept there too! A hankie box could be shaped like a triangle- hankies would be folded on the diagonal, or a square allowing hankies to lay flat. 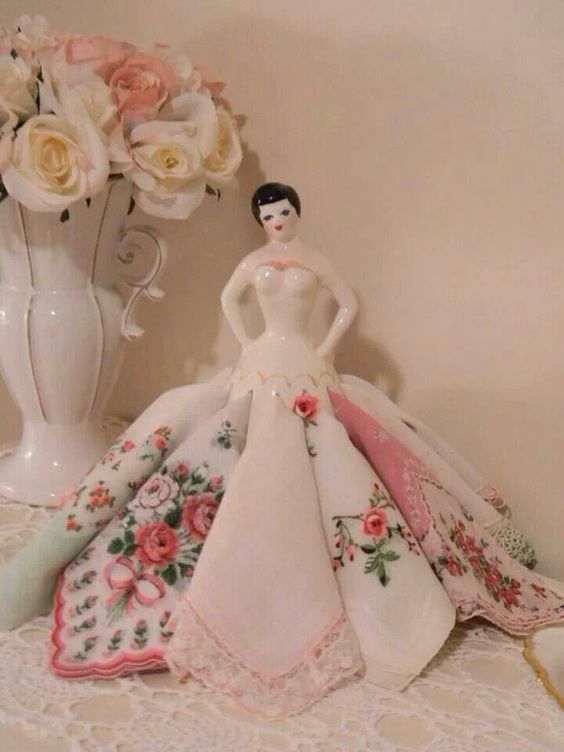 I have found vintage lady figurines with slits to insert hankies into making a skirt for the doll.